(Nov. 8, 2018) -- Millions of couples who have trouble conceiving may get relief from new research led by scientists at UTSA. The researchers have developed a high-resolution genetic map showing how men produce sperm cells. Their effort could help address genetically based challenges with male fertility, a major cause of conception problems. 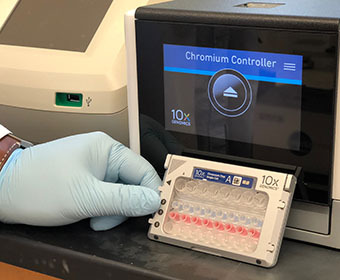 The UTSA Genomics Core center uses the 10x Genomics Chromium instrument which only requires small fragments of DNA to assist researchers with the ability to interpret gene variants that are associated with specific traits or the progression of disease. The researchers’ findings reveal detailed information about which genes are turned on or off in stem cells that ultimately grow into sperm cells. This data could give doctors crucial insight into the development of sperm in a patient, a perspective that was lacking up until now. UTSA researcher Brian Hermann says the new knowledge could be a game changer for uncovering what can go wrong in men who suffer from infertility. The findings appear in the November 6 edition of the scientific journal, Cell Reports. Professors Hermann and John R. McCarrey led the group, which included researchers at UTSA and across the country. Together, the team built a comprehensive digital library of the cell types required for sperm production in mice and men. They examined more than 62,000 cells and identified 11 different gene expression profiles; their work even uncovered rare and new cells for which little data was previously reported. The research, which began in early 2014, was supported by the Kleberg Foundation, the Hurd Foundation and the National Institutes of Health (NIH). According to the NIH, reproduction issues in males contribute to at least half of infertility cases among couples. Many cases of male infertility are treated with medication. Some even require surgical procedures. Yet, in almost half of these same cases, the reasons for male infertility are unknown. UTSA’s digital roadmap was constructed using the sequencing of genes expressed in germ cells. The researchers used high-tech machines which allow scientists to examine tens of thousands of individual cells and produce the library of genes expressed in each cell in one to two days. The method also employed cutting-edge bioinformatics, data analytics that decode gene expression data generated from the cells. 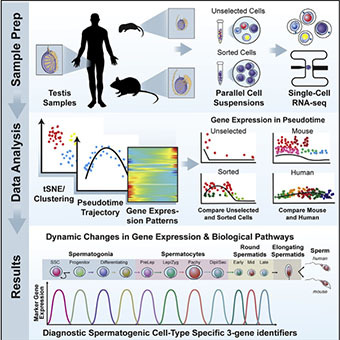 UTSA’s individualized approach to profiling gene expression at the single-cell level is what makes this work different. Previous methods have relied on analyzing groups of cells, but when they are bundled together in experiments, the differences among the individual cells are averaged and therefore obscured. Hence, UTSA’s new approach provides important data that can help uncover the biology underlying how sperm are produced and what may go wrong in men who suffer from infertility. UTSA’s new digital gene expression library offers many scientific applications. It could help improve clinical diagnoses in men with infertility because their gene expression “signatures” will be different than those in the normal men now described in this new database. The UTSA resource can also provide a foundation to help innovate the next generation of male contraception and to even potentially develop sperm outside the body. The researchers are hopeful that the methodology can also be applied to other biological processes in the body in order to uncover new information on which to base novel approaches to diagnose, treat or prevent a wide variety of diseases. The UTSA Genomics Core is one of the leading centers in the country and the only center in South Texas that assists in genomics profiling of single cells.